We have awesome successs stories! 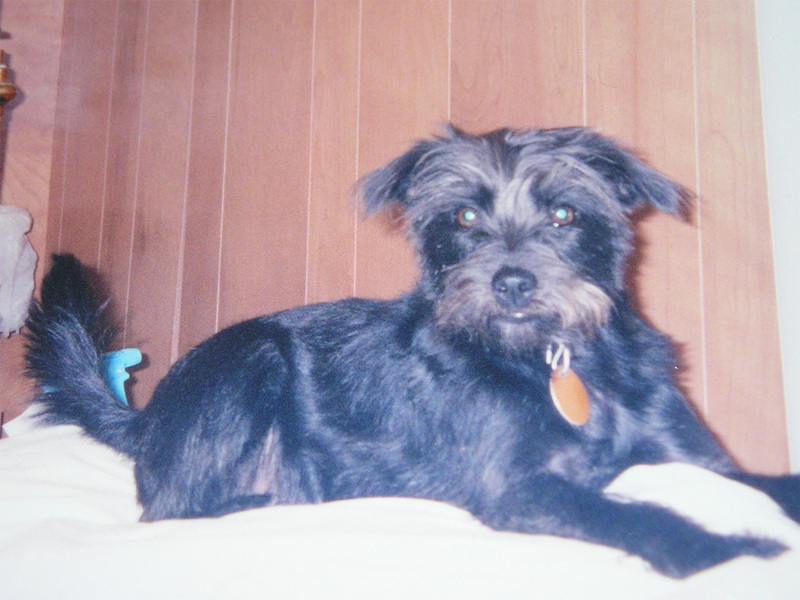 Mandi is a cute little 4 year old black Terrier Mix. 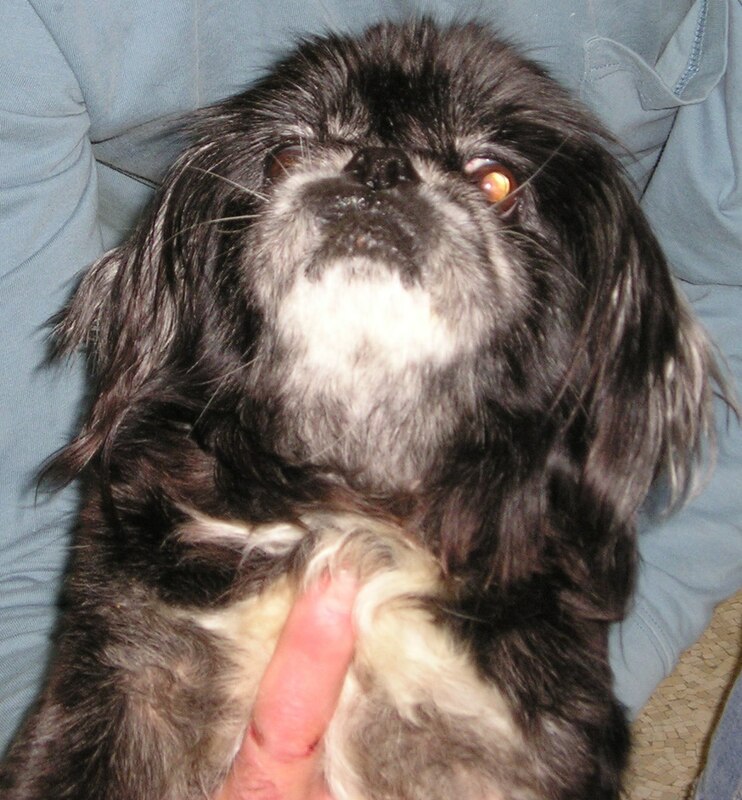 In January, 2011, Mandi's owner, Natalie had an accident in her home. She broke her shoulder and was incapacitated for several weeks. During that time, her friends/family here at Pocoshock Animal Hospital (Pocoshock) and others did what we could to help her out. One thing we did was to bring her dogs, Mandi and Cha Cha, and her cat, Charjen, to Pocoshock to care for them. One weekend we took Mandi and Cha Cha to visit Natalie. While there, Natalie let them out onto her back porch where they have access to her fenced in yard. Unbeknownst to her or any of us, someone had left a gate open. Cha Cha came back in but Mandi ran. She has always been skittish due to her background prior to Natalie rescuing her. Natalie, knowing how skittish Mandi is, thought she would never see Mandi again. The rest of us jumped into action. Bootsie, Tiffany, Jessie (family member), and Gayle drove street after street looking and calling for Mandi. Nobody saw her anywhere. The next day we made flyers with Mandi's picture on them and offered a reward. Bootsie and Jessie drove around the entire area putting up flyers and still looking and calling for Mandi. Everyday for almost a week one or more of us went out looking and calling for Mandi to no avail. Natalie was now more certain than ever that she would never see her Mandi again. THEN... one morning a week after Mandi disappeared, our own Dr. Larsen saw Mandi on her way to work. She called Natalie who then called Bootsie and I and reported the location of the sighting. Bootsie and I immediately drove to the area and started looking. Then, WE SAW HER! Now the trick would be getting Mandi to come to us. We called for her and she stopped and turned to look at us. When we took a step towards her though, she bolted and ended up running down the right lane of Broad Rock Road. Cars and trucks swerved to miss her and all we could do at that moment was watch and pray. She did not get hit and then ran down a side road. Bootsie took me home and went back to look for Mandi while I went for reinforcements. I picked up Jessie to come help and called Pocoshock to give everyone an update. They suggested we take Cha Cha with us because Mandi adored Cha Cha and might come to her. So we went to Pocoshock and got Cha Cha. Just as we were leaving with Cha Cha, Bootsie called to say he had sighted her again and told us where to meet him. Jessie, Cha Cha, and I took off. When we got to the area we got out with Cha Cha on a leash. We could see Bootsie walking in a field towards some woods. Jessie started walking the same way. I had Cha Cha and asked her, "Where is Mandi, Cha Cha? Find Mandi." Cha Cha led me to the left of the direction Bootsie and Jessie had gone. She kept looking under a shed in someone's backyard so I looked too. I did not see Mandi so we started waking towards Jessie (Bootsie had already disappeared into the woods). About half way to Jessie, Cha Cha pulled on her leash. I turned to look at Cha Cha and Mandiwasstandingrightthere between Cha Cha and me! I immediately dove on top of Mandi before she decided to run again. I tried to put the extra leash I brought on her and started calling to Jessie to help. She came running, we got the leash on Mandi, found Bootsie, and took off in our vehicles to take Mandi home. When we got to Natalie's her home care nurse and physical therapist were both there. We carried Mandi in and all Natalie could do was cry, she was speechless - remember, she thought she would never see Mandi again. We were all so happy and seeing Natalie's reaction just warmed our hearts. Team work, a love for each other and a love of animals reunited Mandi with her family. From Duke and his Owner, Brian Sr.
A family that lived across the road from me, that I only knew by waving hello occasionally, moved, and left their dog behind, running loose in the yard. 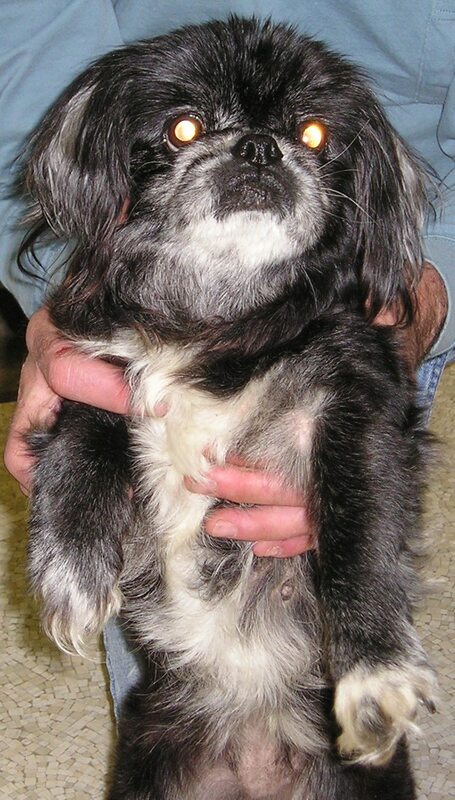 I have had several dogs during my lifetime and my heart was broken to see this dog abandoned like trash. I started giving food to the dog daily, and when it was apparent they weren't coming back for this friendly animal I took it upon myself to take possession of the dog and put him in my fenced yard. He never tried to escape, and always greeted me with licks and rubbing his body up against mine. He became my buddy quickly and I decided to keep him. I took him to the ASPCA to be neutered, given his shots and licensed. Unfortunately he tested positive for heartworms. I called many veterinarians and hospitals to see what the cost is to treat this. I am disabled on a very low fixed income, and was looking for information as to what the cost could be, just a ball park number, to see if I could help my new friend, or if I would have to surrender him to the ASPCA so he could get the proper care. No one would help me, they all refused to give me any information at all, and they all said that I would have to make an appointment with the vet for any information as to cost, even after I explained he did test positive for it and was just looking for possibly the lowest, and possibly the highest it could cost. They just said what I was looking to avoid, spending much needed money on a visit and retest only to find out I could never afford to help him. I decided to make one more call, and found your hospital's number. I explained my situation to the staff member who answered the phone, and was pleasantly surprised when she gave me a fast run down as to what the treatment might entail, and a rough number as to cost in the worst case scenario, and how even after treatment the dog could have severe medical problems. She was polite and showed she truly wanted to help me as to the information I was looking for so I could make an informed decision as to what to do. It was easy to see that I had contacted a first rate and caring animal facility, so I decided to get a loan on the car I own and help my buddy, knowing that I was putting my only transportation in jeopardy and that I might loose my car, but Duke needed my help and had already given me more love than my car was worth, so I made the appointment and brought him in. The Doctor was caring, knew her profession, and explained what she wanted to do to treat Duke. I left the hospital knowing Duke was getting the best care possible, and felt relieved that he was getting what he needed to make him better. I returned at the end of the day to pick Duke up, and when given the bill it was evident that the Doctor did what Duke needed, but also managed to keep the cost as low as possible, an action that I am extremely grateful for. And I did not have to loose my car after all getting Duke treated. And to top all this off the medicine Duke needed was donated to him. I can not put into words how Thankful I am to your organization. It is doctors and staff like yours that make this world a better place to live in. Duke is not just a dog, he is my companion, and I love him. And you gave him the best care knowing how important he is to me, something that the other places I contacted made apparent they could not do. If they could not give me the little information I was looking for so I could decide what to do over the phone, how could I trust them. This is the kind of story that always gives us a warm fuzzy!